The ancient water town of Wuzhen is a perfect example of the waterside settlements unique to east China. These picturesque, low houses and cobbled lanes have been home to generations of traders, artists and officials. Visitors here will enjoy insights into a rare culture that nevertheless remains an iconic image of rural China. This is a must-do for those with an interest in Chinese folk customs and arts. Pick up from your midtown hotel in Hangzhou and head to Wuzhen Water Town. 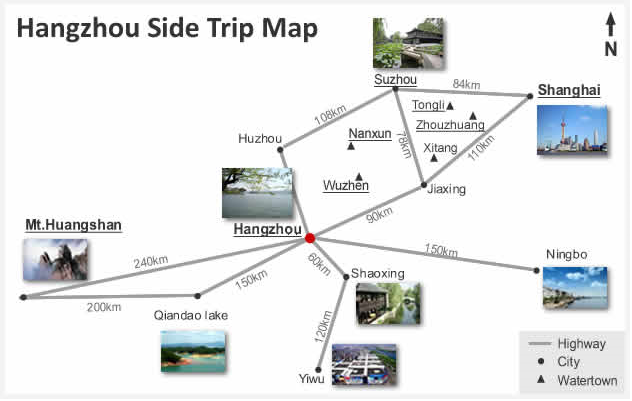 Located 75km away north of Hangzhou, the town is within the triangle formed by Hangzhou, Suzhou and Shanghai. It is one of six ancient water towns south of Yangtze River with a history of over 1200 years. Its residential houses are constructed by the rivers and on both sides of the streets are lined ancient architectures of Ming and Qing Dynasties. Walking along the ancient slabstone-paved streets, standing before the tung oil painted timber framework houses black tiled, you will feel you are back to the years of the past. After the tour in Wuzhen Water Town, you will be transferred back to your midtown hotel in Hangzhou. entrance fee of wuzhen is 120 yuan/pax is on your own .express way toll fee ,petrol ,parking ,guide service are all included and there is no hidden/extra surcharge! Wuzhen(烏鎮) lies at the north of Tongxiang City of Zhejiang Province, and at the center of the triangle formed by Hangzhou, Suzhou and Shanghai. The town covers an area of 71.19km². It is divided into four zones by a cross-shaped river, with the Beijing-Hangzhou Grand Canal running across the town, making it the only ancient water town adjacent to the canal. The town lies on the Hangzhou-Jiaxing-Huzhou Alluvial Plain, with no hills but interlaced rivers. Due to its warm and humid climate, and abundant rainfalls and sunshine, the products here are rich, making Wuzhen well-known as “the town of fish, rice, and silk”. 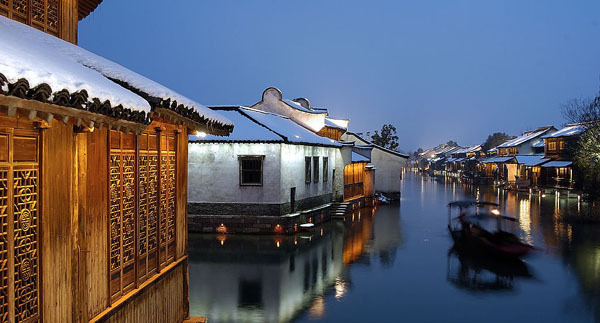 Wuzhen enjoys a history of over 1,000 years since its establishment in 872 A.D. However, according to the textual research of the Tanjiawan site, one of the important cultural relics under state protection, ancestors of Wuzhen had lived here at the New Stone Age 7,000 years ago. The ancient Grand Canal nurtured the splendid culture of Wuzhen, and the long historic accumulation endowed Wuzhen with sound cultural deposits. Over more than 1,000 years, Wuzhen has never changed its name, address, water system or lifestyle. The traditional buildings are still well preserved after crossing so many rough years. Within the town, with a dense network of rivers and wharves, people build their houses along the river and establish markets close to bridges. Stone railings and arch bridges, arched gates across the street, imposing dwellings and spacious courtyards, river banks and verandas are all well preserved, presenting an original ecological scene of a water town in Jiangnan (the South of Yangtze River). Within the town, there are now more than 40 hectares of late 19th century original buildings, and more than 100 ancient stone bridges of different shapes. It is just like a natural museum of ancient architecture. In the town, watercourses and flagstone streets extend in all directions and intercross here and there. The native residents live peacefully in their old houses by water, just like their ancestors do long time ago. 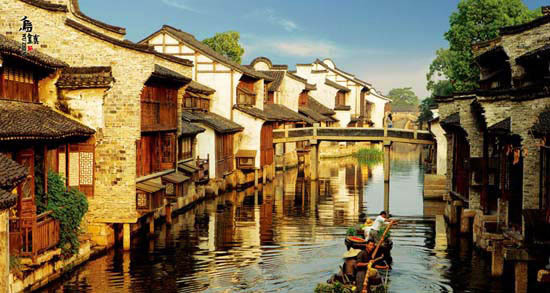 As a famous old water town, whole layout of Wuzhen is largely influenced by the local water system. The cross-shaped inner-river system separates the town into four districts, and the local people call them Dongshan, Nanshan, Xishan and Beishan. In 1999, after the careful investigation, the project of Dongshan kicked off. It is briefly called Dongshan Scenic Area. In order to realize the target of best protection, best environment, thorough function and best management, three measures comprised of heritage protection project, culture protection project and environmental protection project. And many other creative management measures are taken for better showing this gem of ancient towns in China. In 2001, Dongshan scenice area was officially opened and based on its original appearance and rich culture of the water town, Wuhzhen in a short time became one of Chinese best ancient water towns. Its long-standing history and culture, purified and graceful landscape of water town, unique and tasteful local food as well as colorful and diversified festivals of folk custom let Wuzhen become the one vivid exhibition of oriental civilization. Since its opening, annually, more than 2 million travelers at home and abroad are attracted by Wuzhen. It used to be the tour destination for APEC participants and many political leaders of China. In 2003, it won the Asia-Pacific Heritage Award for Outstanding Heritage Conservation. Area Map shows us the whole layout of the water town. The water system, traditional style buildings and the idyllic environment please us too much. As a museum of traditional life and folk custom in Jiangnan area, Wuzhen is the best. Come to Wuzhen for real China's traditional town life. The well-known tourist attractions in Wuzhen include: Fanglu Pavilion, Xiuzhenguan, Ancient Opera Performance Stage, Former Residence of Mao Dun, Ancient Coins and Paper Money Museum, Jiangnan Woodcarving Diplay Hall, Rice Wine Workshop, Jiangnan Folk Custom Museum, Hundred-Bed Museum and Wenchang Pavilion and so on. Each attraction is themed with local tradition and culture. 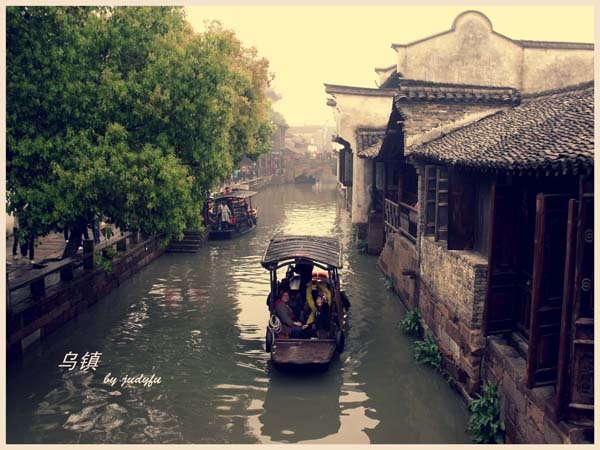 Wuzhen is also famous for its numerous famous people. Chinese first collection of poem and prose was successfully edited by Prince Zhaoming of Liang State in Wuzhen; Chinese earliest town history record was edited by Shen Pin in Wuzhen. Wuzhen is also the hometown of Zhang Yangyuan who was the famous Li master, Bao Tingbo who was the famous book collector or bibliophile as well as the high officials named Lin Yanchen and Xia Tongshan in late Qing Dynasty. There were more than 200 famous learners and officials in Wuzhen from Song Dynasty to Qing Dynasty. In modern times, the famous people include: Mao Dun who was the great novelist and essayist, Lu Xuepu who was the banker, Yan Duhe who was the one of famous founders of Chinese journalism, Shen Liying who was the famous agriculturist and Feng Zikai who was the famous learner, cartoonist and painter. They all came out of Wuzhen and did a great contribution to China.